I love thrift store shopping. Really! I do! In my neighborhood, I have a ton of thrift stores and over the 2 years that we have lived here, I have nailed down which ones are the best for what type of deals and when we go shopping, we make the rounds based on what we’re looking for at the time. The best part? My Emma loves it too! Yes, you heard me right. My Emma LOVES thrift store shopping almost as much as I do! You have no idea how much I love that little factoid right there. Thrift store shopping, is a fantastic way to save money and I’m sure that most of you already know that. It’s a great way to cut your expenses, to save on the items you need and to really pinch pennies if you’re in a position that you need to squeeze every cent out of a dollar. It’s also a great way to make extra money. If you’re not careful though, you could really bust your budget if you find a good thrift store. Don’t feel bad if you’ve done that, it happens to all of us. I can remember one particular trip where I picked up a bunch of things we needed at home and walked out $148 later. 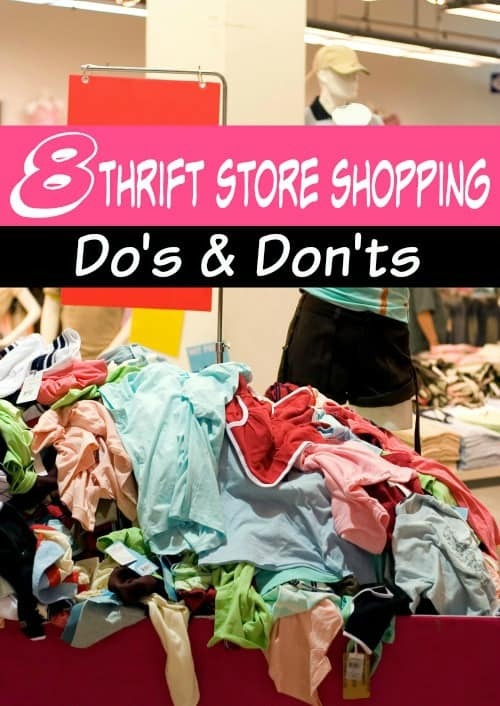 These thrift store shopping tips will help you with that. They’ll keep you on track budget wise and they’ll stop you from buying junk. One thing that bothers me about thrift store shopping is the very common myth that only “poor” people do it or that it is dirty or shameful. Let me help you out here. There is absolutely nothing wrong with buying something secondhand and in fact, it’s right to do. Do you realize how many pieces of perfectly wearable (and in some cases) new clothing, toys, books, and other goodies would be going into a landfill if it wasn’t for thrift stores? They’re no different than garage sales except in the fact that they aren’t just one or two weekends a year. Each and every time we go into ours, I find items, new with tags a lot of the time for pennies on the dollar over what they would have cost me new. Why should I have to pay $50 or more for something just because it comes from the main store? I don’t! I can go to a thrift store and get it cheap! Aside from the fact that you’re helping keep items out of the landfills, shopping at a thrift store really does help with your budget. If you’re looking for home decor items, it can save you signficantly over buying new. It can feed a DIY and crafts habit for pennies over a retail store. They can clothe your family in very nice clothing for much less than buying at a regular store. Letting yourself get wrapped up in a myth or common thought about thrift stores is only serving to cost you big bucks over time. Case in point: See the photo above? 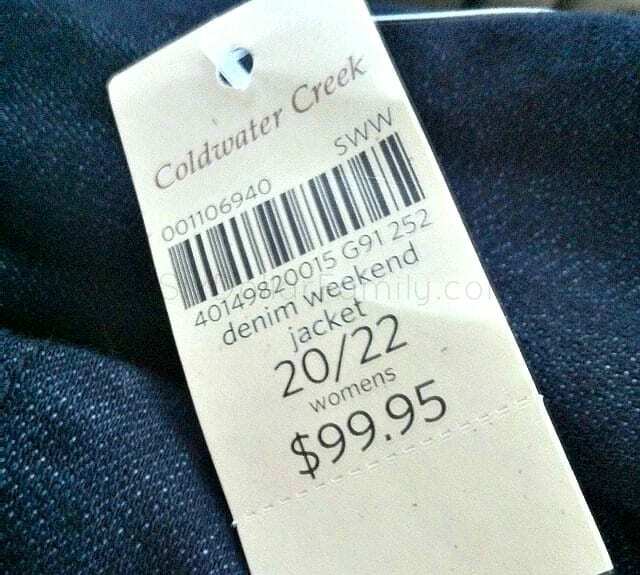 That is a picture of a fall Coldwater Creek denim jacket that I bought from Goodwill. It was brand new with tags and absolutely nothing wrong with it. You can clearly see that the retail tag says $99.95. Know what *I* paid for it? $6.00! At no time in my life would I EVER consider paying $99.95 for that jacket, but $6.00? You betcha I’ll pay that for it! Know Your Prices When Thrift Store Shopping – Just because you are at a thrift store doesn’t mean that they will always have the best price or the best buy. Knowing what something costs new can save you from buying a dud deal used. If you know that a toy only costs $15.00 new, why would you pay $18 in a thrift store used? In this case, buying it new, even at regular price, would be the better deal. This one is especially important which is why it’s first. I’ve seen a lot of cases where a thrift store, one in particular, has a very bad habit of marking their items at retail prices. Shop With a List in Mind when Thrift Store Shopping – Shopping with a list doesn’t just apply to the grocery store and thrift stores can be just as dangerous without one. Before you shop, mentally go over everything you need to find and only purchase the items that are on your list. Don’t buy something just because it’s a good deal. The only exception to this is if you know (as in know 100% certain) that you will need the item in the next couple of months or that you can make a profit from your thrift store score. If your daughter has prom coming up and she happens to find the dress she has to have, go ahead and pick it up if it’s cheap, but keep your extra buys only to those items that you are certain you will have a need for. Shop at the right time of day when Thrift Store Shopping – The deals that you’ll find when you shop are dependent on what time of day that you shop usually. Shopping in the morning means that you’ll have access to any new items they’ve put out while shopping in the evening generally means they’re putting new items out as you shop. I have found that shopping in the middle of the day usually means I won’t find as many items. Figure out when you stores add their new items and try to shop around that time frame. Shop the sale when Thrift Store Shopping – Yes, you heard me right. Thrift stores have sales too. A lot of the time they are tag based sales. Check the item that you want to buy for a colored tag. Usually there is a sign at the front of the store that will tell you what color tags are on sale. You can usually find items marked down 50% and sometimes even 75% off of the secondhand price! Finding those items can really add some bulk to your savings! Also, keep an eye out for bag sales. I have seen promotions where thrift stores have sold brown paper bags for $1 or $2.00 each. Whatever you can fit in that bag, goes for that price! These are typically my favorite types of sales because you can usually get A LOT of items in those paper bags making shopping them even more worth it! Don’t forget about online thrift stores – Online thrift stores or consignment stores are a fantastic thing and if you find the right ones, you’ll agree! My favorites are ThredUp, Schoola and Swap. Between the three I’m able to get really great deals on clothing for myself and Emma, books, movies and more. An online thrift store is a great way to save money while never having to leave home which in the online shopping world? Is rare. Keep Your Wallet Close when Thrift Store Shopping – I don’t mean in case of theft (although it’s never a bad idea to protect your valuables), I mean in terms of spending. Do not go into a thrift store without setting a budget for yourself. This is the single most absolute way to overspend in a thrift store. The one and only time that we went into one without out setting a budget was the time that I walked out paying $148.00. Before you shop, sit down and look at your finances. If you’ve only got $20.00 to spare for shopping, then don’t spend more than $20.00. You’ll have to hold yourself to your spending limit, but don’t let yourself go over. One very good way to make sure that you stick to your thrift store budget is to only take cash with you when you shop. This is one of my favorite thrift store shopping tips for one reason. If you’ve only got $25 in cash on you? You can’t spend anything more! It literally forces you to stay to your budget. Be careful what you pay for when Thrift Store Shopping – Thrift stores are notorious for not testing items before they put them on the shelf so be sure that you do. Otherwise, you may end up paying your hard earned money for an item that doesn’t work. Always double check something and do not assume that just because an item is new in the package that it works like it is supposed to. Always test something and if you can’t test it? Walk away. It isn’t worth the risk of getting an item that doesn’t do what it’s supposed to because it’s cheap. thank you for the tips! My tip would be bedding … if buying a new package of sheets make sure it’s what’s really in the package. Take it all out and double check the size. Needing sheets for our bed I went to check the thrift store. There was a sealed package of queen in that was a perfect match with my bedroom color. I believe I squealed out loud and did a happy dance there in the store. $20 for super high quality – okay, that’s less than new so I’ll take it (there are 2 thrift stores in clunky-dunk town and they are always over-priced). I did think to open the package, I pulled out the top, happened to be the top/flat sheet. Yup, queen size, good to go. Got home, washed and went to adorn my bed only to realize, the fitted was a king size! I was so frustrated and mad with myself for not checking everything in the package. You are so right about thrift stores. I buy all the yarn they have. It is new from the retail stores. Then I crochet all kinds of scarves-bath puffs it’s a long list. Then I sell my items and make a huge profit. I pay $1.00 and under for each roll. It takes 1 roll and one hour to make a $12.00 scarf. I also get clothes,gifts,school supplies. You can get just about everything you need there. The only thing I can not bring myself to buy are the shoes. You can even find undergarments new still in the package. My family thinks I am crazy for shopping there. But like you I got a $99.95 jacket for $7.00. Just yesterday I got a $44.95 Lane Bryant blouse for $3.99. This post makes me feel even better.I am not crazy I am doing the right thing. I have never thought about all that stuff going to a landfill. You have giving me a better agement for my family. My whole family is strict on recycling. Thank you. I do apologize for the lengths of my response. Check check check zipper. Check at collar for holes near tag. Check were the tag is to make sure there is a hole torn from pricing. It’s also good to check pockets for holes. I spent two years working in a thrift store and left to be a full time mother and wife. People that look at this stuff all day miss small things. It is very important to check any item over before you buy it. As far as shoes go check the bottom to see how much wear and tear they have on them. I purchased to that had been originally priced for over $300. for the retailer . I paid $15.and $30.for them. I had to wait 4 hours before I could purchase either pair. I also found a diamond stud earring in the bottom of a tennis shoe. I never overspend at the thrift store because I won’t buy anything over a few bucks normally. It also depends on your area. Many hire people who know brands and price them high. Others don’t and you can get steals. I also recommend going to wealthy parts of town as they usually have better stuff. All of your tips on Thrift Store Shopping are spot on. One of my favorite tips is to set a budget for yourself Before going shopping. Once I did not follow that advice and went over board. Also, although its been said a hundred times, Check everything thoroughly before purchasing it. Its so easy to overlook something when it has a tag showing its never been worn. Sometimes, the seams in the seat of the pants are not tight, even buttons that will not snap together. Thanks for your post. I also love thrift and consignment store shopping. I rarely shop retail, because why would I choose to pay up to ten times more for anything? It just doesn’t make sense to me. A few tips I would add are: 1. Buy holiday items right after the holiday. 2. Inventory changes daily so don’t get discouraged when you don’t find anything. You might find everything you want the next day or the next week. The more frequently you go, the more treasures you will find. 3. The best shopping (IMO) is in the Spring, because people do their Spring cleaning and decluttering then. 4. If you have young kids, let them pick a toy from the toy section to play with while you browse. By the time you finish shopping they are usually finished playing with the toy, so you won’t have to buy it. It’s a win-win! Believe it or not, I actually do better at Macy’s and JCPenney than at the thrift store, goodwill, Ross etc. I shop sales and combine coupons with the keen eye that’s sharper than a hungry vulture! Jessie, I think it really is hit or miss as far as pricing at Goodwill stores. We’ve found some with amazing prices but others that are just insanely high. Believe it or not, many thrift stores have what I consider specialties. For example, women’s pocketbooks. I never buy a pocketbook from any place other than a thrift store, where if I look long and hard enough, I can always find something unusual and often quite beautiful. Pocketbooks from department stores and similar are usually quite expensive as well as ordinary in appearance. Crocheted or knitted bed covers and throws can be another place to concentrate on, if you need one of same. Especially in summertime, look for these–when it’s hot outside, most shoppers aren’t interested in trying to find a gorgeous bed cover or throw. Wall art I consider another thrift shop specialty. You will find something gorgeous for your wall(s) eventually, so don’t bother to try to look for it. Just be patient and one day you’ll stumble on just what you want/need. Guaranteed! As everyone knows, thrift stores almost always have huge quantities of used sheets of various sizes. It takes a lot of looking, but a well-made king-sized sheet in the right color/pattern can be bought and used as a handsome, unusual cover for your large dining room table. Elegant! I found a $150 NWT Kersch Jeans andI find Calvin Klein, H&M and other designer jeans for $4 NWT, Coach, dooney & Burke purses for $11. Once I bought a tapestry purse for $0.68 cents, yes cents, and sold it for $45 in one day, after posting it for an hour. Not bad. BUT, to find these bargains, I had to go to the worst part of town to the biggest thrift store. I literally had to step over the homeless to get inside! That’s why I go in the morning while everyone is still asleep or lethargic..Hah! I NEVER have found ANYTHING at ANY thrift store in a nice area or neighborhood, except one thing, my Kenmore sewing machine. It’s awesome. I could thrift shop 24/7 365. Love it. Everyone gets pretty jealous, especially about the purses. Hey, I know how to clean them and get the ink stains off the leather without damaging the pocket book! they are cheaper, a lot cheaper if they have ink marks on the leather..
O, and Jewelry. Vintage is my favorite. Especially when it’s SS or Real Gold. I can clean and repair it as well. Jack of all trades I am. My biggest tip – TRY ON ALL CLOTHING. I find I can dwindle down 1/3 of my clothing choices by trying them on before purchasing. A lot of times sizing varies by brand. I just scored 8 tops for $27 yesterday. I agree fully! Always test an appliance. I bought one, the store was so busy, they could not let me test it. They verbally guaranteed it would work, but it didn’t, and it was a 45 minute drive to even try to return it. Chalked it up to lesson learned. Do walk away if you cannot test something! I buy Christmas presents at Goodwill and Salvation Army, if they are new, what difference does it make to the receiver. I have decorated my whole house from garage sales, Craigslist, and thrift stores. I like our “Finds” as hubby calls them. We did Christmas last year for well under $100. And there were plenty of presents for everyone. I needed a heavier coat for winter, and since I’m a 3x bordering on 4 with all my clothes on, I needed something large. I also didn’t have a lot of money to spend on it. I went to Goodwill and for less than $10 got a $125 coat that, while WAY too big, and sheds feathers, at least keeps me warm on those occasional cold Texas winter days. When I was a single parent, that was the way to go with limited funds for the kids. I’ve always found deals and with a waist lines that changes almost weekly, it’s nice to go and spend $20 for a complete outfit verses the $30 for just one piece of the puzzle. I love the challenge of looking and if I walk of with something, its a good day; if I don’t walk out with something, well, that’s ok to, because it just means that nothing “spoke to me”. On the flip side of thrift and consignment, there are the resale shops that are out to make money and will “Overprice” certain things. I’ve seen donated furniture, NWT for the same price as the store. These places are usually trying to make money for christian schools. While a worthy cause, i can’t justify paying “quarters on the dollar” for something that was donated from a store becuase it’s been discontinued or was last seasons “deal”. Sometimes I can’t justify the purchase of something that is almost the same price as the “Name” store. The best deal i found was 10 years ago on a microwave (had to replace the other one when it wouldn’t turn on) and I bought a used one for $25. It still works great and I don’t plan to replace it until it decides it doesn’t want to work anymore … they don’t make things like they used to either, so I love to find things that are older and well used … it means it’ll last a whole lot longer than new. I’ve gotten a lot of use out of that $25 and I’m still not done. thanks for the great article, it’s good insight for those who are considering the practice to same money and their sanity! I adore thrift shopping. I too, have to dress business casual at my office. I like variety but who can buy 3 or 4 fancy cardigans at $35+ a pop. Goodwill is my go-to. I got some jeans that retail for $75 and paid $5. Thank you for these tips! Also love that you get a $10 credit at Thred Up! Looking forward to online shopping there as well. In my area they have a $0.99 on certain color tag clothing every Monday. I was able to basically redo my entire wardrobe and get all kinds of school clothes for my son. He ALWAYS seems to find some cool toy in there too so he loves it! I’ve gotten tables, desks, all sorts of things for my home that could’ve easily cost me hundreds for pennies on the dollar. I even got my husband on board when I found two high quality name brand shirts that fit him just perfectly for $0.99 each. I’ve been thrifting with my mom and grandmother since I was a kid but never really had an appreciation for it until I got older. I just can’t bring myself to do the whole retail thing anymore. It’s a thrill to me to thrift. I LOOOOOOOOOOVVVVVEEEE IT! Awesome! It sounds like you get amazing deals Sage! Great job! Nice Teresa! We love those book sales at the library too! Can’t beat the price! Thanks so much for the comment!